Tablet Time | Features | Kids VT - small people, big ideas! In a recent conversation with "Late Night" host Conan O'Brien, comedian Louis C.K. went on a tirade about why he won't be giving his two daughters smartphones. Kids who use them become less answerable to their peers and more prone to making mean comments online, C.K. opined. Furthermore, the comedian described how the technology is creating dependency among both children and adults. "The thing is, you need to build an ability to just be yourself and not be doing something. That's what the phones are taking away, the ability to just sit there," C.K. said, placing his hands in his lap like someone waiting patiently for a bus. "Like this. That's being a person." For many, his diatribe struck a chord. Within two days, the video accumulated almost two million hits on YouTube. One need not be a parent to understand the comedian's complaint: When even a well-adjusted adult can't wait in line for coffee without stealing glances at his or her smartphone, what's to stop flashy mobile technology from kidnapping the inexhaustible curiosity of our children? Parents and educators who oppose one-to-one computing initiatives for preteens often cite reasons similar to C.K.'s. Last spring, Williston residents voted down a $15.6 million school budget — up 5.09 percent over the previous year — that would have provided an iPad to every fifth and sixth grader at the Williston Central School. 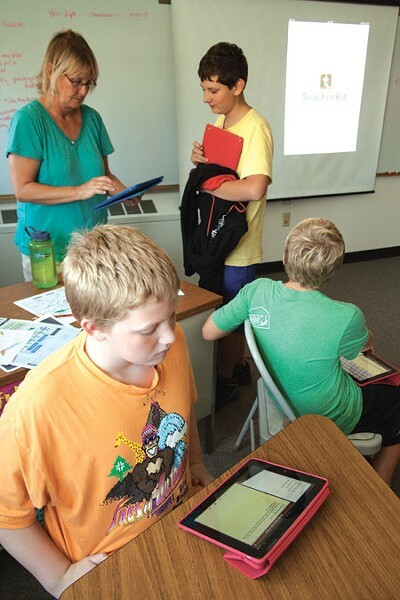 The iPads were the "big, lightning-rod issue," says Kevin Mara, chair of the Williston school board — not just how they were going to be used in schools but at home, too. "Some parents brought up concerns about screen time, which [kids] get enough of already. Another concern was that if not used properly, there would be loss of interaction between teachers and students." Although some studies have suggested that increased availability of laptops and even iPads can improve student performance, others seem to indicate otherwise. Two Canadian researchers tried to measure the effect of multitasking in a study published in Computers & Education earlier this year. In a college lecture situation, half the students were instructed to take notes using their laptops; the other half were invited to listen, take notes and also accomplish another set of tasks on the computers if they felt they had time. The multitaskers ended up scoring 11 percent lower on the quiz at the end of the class lecture — the difference between a B+ and B-. Students at the Lake Champlain Waldorf School, a private K-12 school with campuses in Charlotte and Shelburne, don't see a computer until they enter the eighth grade, explains instructor Abigail Diehl-Noble. That's because the school's philosophy, developed in 1919 by the Austrian philosopher Rudolf Steiner, revolves around the idea that early education should challenge children to engage in hands-on activity and creative expression. 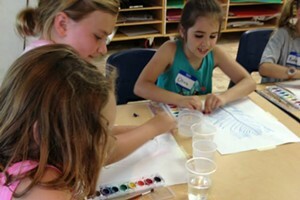 Through grade school, students get outside as much as possible and express themselves through movement and art. By eighth grade, students get a comprehensive course in the history of computing technology, from the industrial revolution to the formation of Facebook — learning how to use typewriters and word processors along the way. Before they can navigate the virtual world safely, Diehl-Noble explains, "We feel that adolescents need a lot of practice interacting and negotiating face-to-face with people. When they say something mean to their peers, they have to face them." Waldorf is not anti-computer, Diehl-Noble emphasizes. Its high-school students use computers in some classes and can check out laptops. The idea, Diehl-Noble explains, is to prevent the premature introduction of a computer program that may force students to choose one set of answers, narrowing their view of an issue. "That delayed gratification is important for kids," Diehl-Noble says. "If we can delay computer use by students, it can add to their maturity." Students at Hinesburg Community School use their iPads during class. There wasn't a pencil in sight during Paul Lasher's first-period math class about prime and composite numbers last month at the Hinesburg Community School. Instead, on every desk was a shiny, new iPad. Each sixth grader had opened an app called ShowMe, which allows students to "write" on the iPad's touch screen with their fingers. When Lasher asked the class to determine some of the factors that go into 120 and 180, 25 sets of fingers began skimming, jabbing and sliding to produce the answers. Hinesburg's pre-K through eighth grade school is one of many in Vermont that is giving iPads to its students. Introduced in 2010, the devices have quickly become educators' go-to computing tool. Teachers are finding ways to incorporate the tablets into math, English, science and even health classes. At Hinesburg, lesson plans now include shooting, editing and watching videos, and viewing images from the teacher's microscope beamed to each student's tablet. No more waiting in line to press an eye up to the lens. "It's a 3-D learning experience," says Jessica Wilson, Hinesburg's technology integration specialist. Wilson worked with Lasher and science and literacy teacher Angela Galyean to get the devices into their school. Although she didn't even own a smartphone at the time, Galyean recognized that an assortment of interactive iPad apps might help her students learn about the solar system. Together, the trio applied for a 2012 Bentley Award. The prize, from the Vermont Technology Alliance, honors Bentley Davis Seifer, a technology-loving 12-year-old from Burlington who died in 2011. Hinesburg was one of three award winners, netting $3000 and a $300 iTunes gift card to spend on apps. The school used the money — as well as funds rerouted from its technology budget — to pilot a one-to-one computing program, so called because it provides one device to every student. Wilson says the school had long considered implementing something similar; the award made it possible. Now that each sixth and seventh grader has an iPad — for a total of 104 — the next step is getting them to eighth graders, without asking taxpayers to increase the school budget. That is no small feat: Not including apps, the starting retail price for a single iPad is $400. Hinesburg is reallocating its technology budget. "We are not getting more money to fund this," says Wilson. "We are just changing what we are purchasing" — that is, tablets instead of laptops or desktop computers. For now, Hinesburg students store these pricey devices in a large, metal security container at the end of every school day — and with good reason. A rash of thefts earlier this year underscored the importance of safe storage. The school is also thinking about letting kids take an iPad home, if their parents provide a small security deposit to cover potential damage. But Lasher says the devices — each of which is outfitted with a rubberized cover and plastic screen protector — are surprisingly durable. "I mean, we had a kid throw up all over one last year, and it was fine," he quips. So far, Hinesburg is the only school in the Chittenden South Supervisory Union to adopt a one-to-one iPad policy. A 2012 survey by the Vermont Agency of Education shows that at least 12 schools elsewhere in the state do the same. Franklin County, for example, has four schools reporting a combined total of more than 600 iPads. Schools in Burlington, South Burlington, Winooski, Essex and other Chittenden County towns have incorporated the devices into their lessons, but not to the extent Hinesburg has. Orleans, Washington, Addison, Orange, Bennington and Windham counties each had one school report using the device. The 2013 number of schools using iPads is likely to be higher, predicts Peter Drescher, technology coordinator for the Agency of Education, based on conversations he's had with teachers over the summer. "There's an emphasis on the tablets now because that's becoming the tool of choice, so to speak, for schools," Drescher says, citing mobility and speed as reasons for their growing popularity in education. The old computers could take several minutes to boot up. "With the tablets, they push a button. It's on, and it starts working. That is the one thing the tablet has really solved. I think that's been a key driver." Parents in Hinesburg don't seem to object to the increase in screen time. Becky Ouellette-Morton, a mother of four and a clinical instructor at the University of Vermont, says her son Luke, a seventh grader, wasn't challenged by all his classes in the Hinesburg school system. But in Galyean's class last year, Ouellette-Morton says the iPad helped Luke stay engaged even after he finished the lessons at hand — Galyean went out of her way to download extra apps for him. "During the day, it gave my son something to focus on," says Ouellette-Morton. "Maybe that something isn't lab time or time with the teacher, but it did allow him to use the iPads to solve a problem." Hinesburg Community School health teacher Cindy Stanley helps students navigate lessons on the iPad. Speaking during their lunch hour, Galyean and Lasher both emphasized the way the devices help them tailor their lessons to the needs of individual students. To use them effectively, the teachers both took a three-hour workshop on incorporating iPads into the curriculum. They now spend time every weekend researching new apps, Galyean explains. "We're starting this year with the things we know really work, and are sprinkling in some new ones, too," Lasher says. But are the iPads effective learning tools? Although Wilson cites an overall bump in the Hinesburg sixth-grade students' math and science scores last year, she says the school has not yet been able to collect any solid data on their own two-year-old program. Tablet computers have only been on the market for a few years, so the information is limited for any school using the devices. Nationwide, the results have been no more conclusive. From 2010 to 2011, the textbook publisher Houghton Mifflin Harcourt had a group of students in a Riverside, Calif., middle school use iPads in an Algebra 1 class. At the end, 20 percent more of the students in the iPad group received a score of "Proficient" or "Advanced" than those without tablets. Last year in Maine, the state widely credited with developing the one-to-one model, the Auburn school district provided iPads to 129 kindergarteners across six schools. 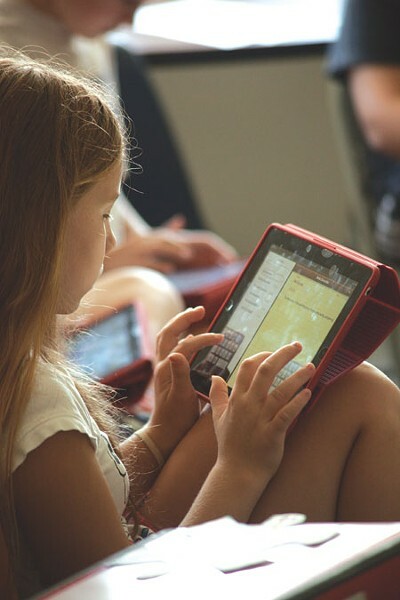 After nine weeks of using iPads to perform reading and writing activities, those students performed marginally better than their peers in a range of literacy areas. The results in Enosburg Falls have been similar — promising, but no slam dunk. The middle and high school bought laptops for every student five years ago. Last year, the school system invested in iPads for every student and teacher from the fifth to 12th grades — almost 500 of them — and let responsible students bring the tablets home. High school principal Erik Remmers notes that schoolwide scores on the New England Common Assessment Program have improved noticeably in the last five years. And the most encouraging NECAP gains, he says, have been among students who qualify for government-subsidized lunches, an indicator that their family is at or below the poverty line. Average NECAP math scores for middle school students in that group doubled between 2008 and 2012. Teachers deserve much of the credit for student improvement, Remmers says. But the principal adds that it doesn't hurt that students who might not normally have access to technology can now bring an iPad home. To boost the number of schools using these tools, Vermont's Agency of Education has crafted contracts with three technology companies — Apple, HP and the Oregon-based computer company CTL — that would enable schools to purchase devices, apps and four years of professional training. So far, according to Drescher, only six schools across the state have expressed interest; he expects the initiative to draw more support next year. Some ed experts — including Elliot Soloway, a professor of education at the University of Michigan — question the wisdom of placing so much stock in an Apple product, when tablets running the Android platform offer essentially the same educational apps and cost half the price. But Soloway doesn't dispute that schools should provide a tablet to each student. "If you look at every organization, if you look at every discipline, it has computers in it. Except one, and that's education. So schools that have said, 'We're not going to go one-to-one,' they're saying we're not going to participate in the most exciting, most transformative, most opportunity-giving development ever," Soloway says. "All those students should be fluent and fluid in the technology of today and tomorrow."